We were in the mood for a relaxing lunch by the water, and Madfish Grille offered both a stunning view and an interesting menu. We found a lot to like at this Rocky Neck spot, including a funky seaside décor, delicious sweet potato fries, and a variety of sandwiches to choose from. There were a few drawbacks, but on a sunny day overlooking Gloucester Harbor, we’re willing to forgive quite a bit. A large step up from many seafood restaurants in the area, Madfish’s appetizer menu includes PEI mussels, potstickers, and a braised short-rib quesadilla. We decided to share one of the day’s specials, iron seared U-10 scallops with roasted cipollini onions, rendered bacon, and a maple butter sauce ($12). They were perfectly cooked with that great balance of savory bacon and sweet sauce, making us wish there were more than two on the plate. To be fair, our waitress told us there were only two or three per plate, but four scallops for a $12 shared appetizer is really not too much to ask. The lunch menu runs the gamut from pizza to burgers, cuban sandwich to fish and chips ($8 to $19). We went with the crab and avocado BLT ($10), which was good but not great; could have used more avocado and a better roll. The grilled eggplant sandwich with spinach, tomato, fresh, mozzarella, and balsamic spread ($8) was delicious except for the roll, which again was too sweet and too soft. As mentioned, the sweet potato fries were hot, crispy, and plentiful. Service was a mixed bag: friendly and never rushed but lacking some basic niceties like plates for our appetizer and an offer to wrap the remains of our sandwich. 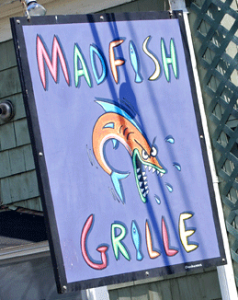 All in all, Madfish is a spot worth knowing about, and we’re thinking of returning to sample a few of the more pub-like items, maybe on a night when a band is playing in the outdoor bar.